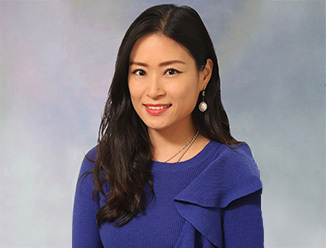 Hong Kong, July 13, 2015 – As environmental issues have increasingly become a pressing concern and economic development is shifting towards sustainability, green buildings in China are starting to get active support from the government. Currently, two rating systems, i.e. China’s national Green Building Evaluation Standard (GBES) and LEED by U.S. Green Building Council, have both been adopted to evaluate green buildings in China. By April 2015, China has achieved total 320 million sq. m. of green building space (certified by both rating systems), 154 times higher than the gross sq. m. in 2008 when GBES was initially launched. China’s green building sector has stepped onto fast track towards large-scale development. 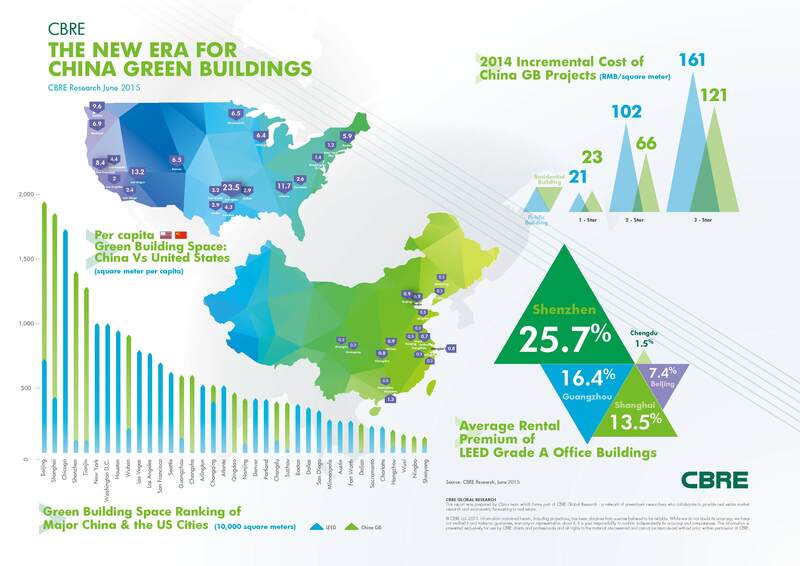 According to CBRE’s recently published white paper “New Era of China’s Green Buildings”, Beijing and Shanghai, each with nearly 20 million sq. m. of green building space, both took the top 2 spots in the rankings of global green buildings, surpassing other metropolitans such as Chicago, New York and Washington. China’s Shenzhen and Wuhan were also among the top 10 cities on the list. The white paper also suggested that first-tier cities such as Beijing and Shanghai, where the concept of green buildings was introduced earlier, have begun to harvest economic benefits from green buildings. As the concept of being environmentally friendly stays firm for the government, businesses and individuals, “going green” has increasingly become an important element in CSR and employee engagement programs for both MNCs and domestic companies. As a result, green building certifications are enabling real estate projects, especially commercial properties, to differentiate from their counterparts in the market. Space that is “green” certified can help landlords attract quality tenants, as it can provide a comfortable and healthy workplace for its employees and improve their productivity. Cost is a critical consideration for developers in their decision-making process. However, extra costs incurred from green buildings are not as high as people thought. Projects deployed under GBES are only 0.8% - 6.1% more than non-GBES buildings. The incremental investment primarily covers seven aspects including outdoor construction, optimization of enclosure structures, utilization of renewable resources, cold and heat storage facilities, the use of non-traditional water sources, indoor environment control and intelligent systems. 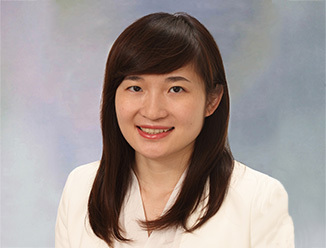 According to property sustainability cases from CBRE’s Asset Services division, with the early involvement of green building advisory panel, there is hardly any extra hardware investment for new buildings to achieve LEED Gold certification if they are designed in compliance with national GBES. If these projects aspire to get LEED Platinum certified, the extra cost would only be 2% more. Based on CBRE’s previous experience, the cost increase can soon be absorbed by operational cost savings from technology upgrades. With the emergence, advancement and adoption of green technologies, products and construction techniques, developers will be able to choose more viable green solutions with the assistance of the expert teams and advisory firms. Driven by growing market demand and supportive measures by the government, CBRE believes that green buildings promise good outlook as a truly cost-effective investment. Although China performs well in major cities in rankings with US peers, average green space per capita in China is still far behind US. CBRE’s study shows that Shenzhen took the first spot among Chinese cities with 1.31 sq. 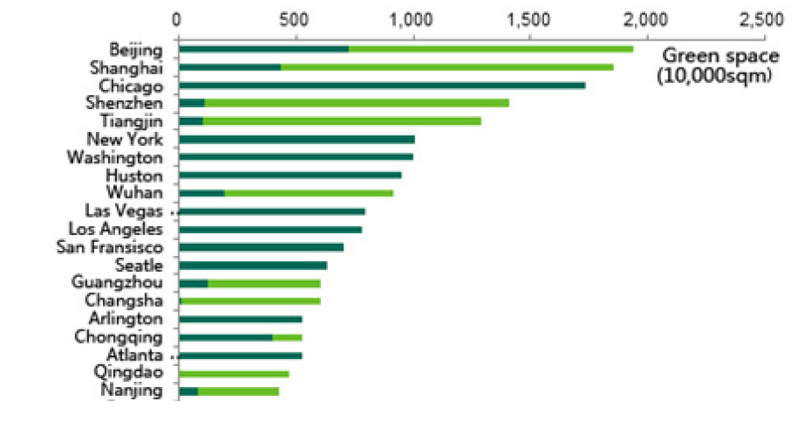 m. of green space per capita; however, it was only the 20th on the global list. Whereas in the U.S., green certified space per capita is 1 sq. m., and in some cities, the number can be as high as 10-20 sq. m. In comparison, except for Shenzhen, all other Chinese cities own less than 1 sq. 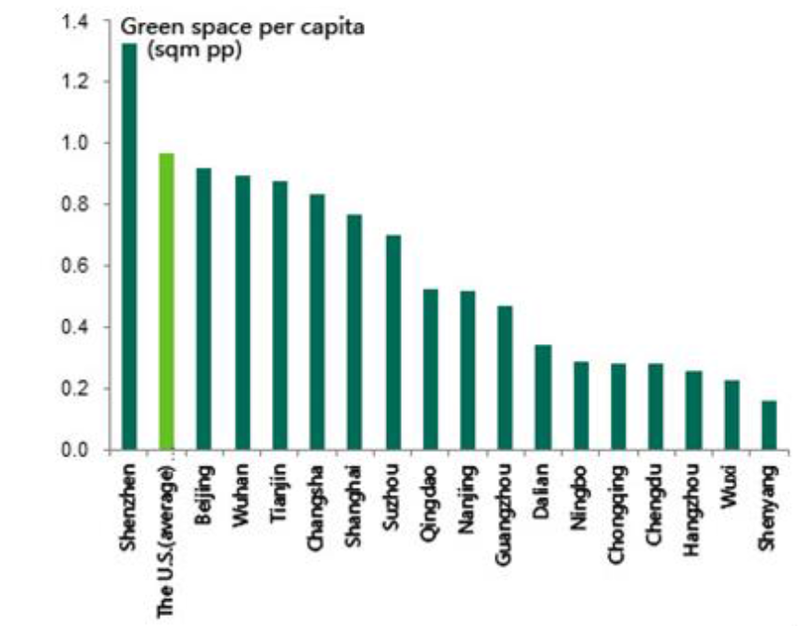 m. of green space per capita, and Shenyang, as a 2nd-tier city, has even lower rate, standing at only 0.2 sq. m per capita. According to a survey conducted by the National Bureau of Statistics, the floor area of new buildings constructed during the period of 1995 to 2013 in China totaled 43.4 billion sq. m. Based on this data, to date, the estimated gross floor area of existing buildings in China has exceeded 40 billion sq. m. Only less than 1% of these buildings can meet green building standards. Meanwhile, new constructions in China are growing rapidly, at the rate of 1 billion sq. m. per year. The tremendous amount of constructions represents a huge challenge as well as opportunities in raising overall energy efficiency in China. However, policy effectiveness and evaluation processes for green buildings still fall short in China. With the “Standard for Green Performance Assessment of Existing Building Retrofitting” being submitted for approval in 2014, we believe that green transformation of existing buildings will gradually be placed on the government’s agenda.